Warmer, sunny weather means more frequent dog park and dog beach visits and traveling with your dog both around and out of town. Whether you’re just bringing your dog to daycare for the day or going on a long road trip, keeping your dog safe in the car is super important! Here are 5 dos and don’ts for doing just that. Just like humans, canines need plenty of food, water, and potty breaks on longer road trips.Collapsible water bowls are handy to have! Some dogs can even experience motion sickness, so frequent breaks are highly recommended. If you need to keep your dog entertained while in the car, try a frozen Kong stuffed with peanut butter or a fun recipe! Allowing your dog to sit in the front seat is both distracting and dangerous. Puppy cuddles and kisses are cute, but not cute enough to risk getting into an accident! If the dog is small enough, he or she could even end up on the floor, limiting your ability to brake or accelerate. In addition, if you do happen to get in an accident, most dogs will be severely injured or killed from the airbag deploying. Did you know that airbags deploy at 200 MPH?! Play it safe by keeping your dog in the backseat. It’s always adorable to see dogs sticking their heads out of open windows, but it’s definitely not the safest option. Dogs can be injured by other cars, rocks, pebbles, and other flying debris and objects. You may think you’re keeping your dog safe in the car by investing in a crate or harness, but unfortunately the majority of the products on the market are NOT crashed tested or safety certified. In fact, there was no organization certifying consumer pet safety products or even conducting crash studies until the Center for Pet Safety (CPS) was founded in 2011. You can view all certified safety harnesses and crates on the CPS website. 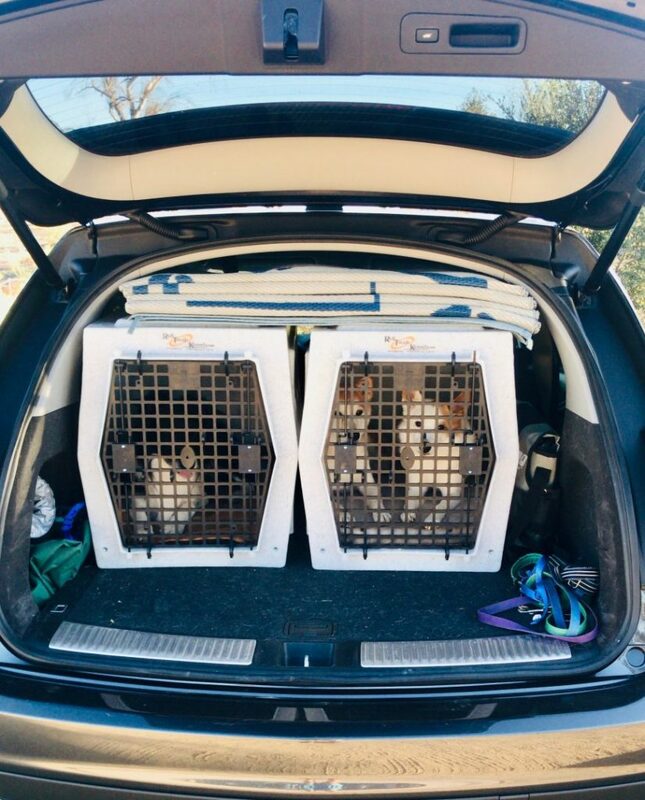 Sleepypod’s entire line of Pet Travel Carriers have successfully passed the Center for Pet Safety Certification Testing, and several of their harnesses have passed as well. You can buy the Sleepypod Clickit Sport Harness and the Sleepypod Mobile Pet Bed on Amazon. Though it may seem obvious, keeping your dog safe in the car includes monitoring the temperature. Never leave your dog in a vehicle unattended, even if it doesn’t feel that hot outside. Temperatures inside of a car get reach deadly levels fast, even with the windows open, and it’s illegal in many states to leave your dog in the car alone. It only takes about 10 minutes for the inside of your car to reach 94 degrees on a 75-degree day. In addition, your dog is essentially wearing a fur coat and can only release body heat through panting and through their paw pads. Brachycephalic breeds like Pugs, Boxers, Bulldogs, Shih Tzus, and Mastiff are especially at risk for heatstroke. Before traveling, it’s extremely important to ensure your dog is up-to-date on all vaccinations, especially the Rabies and DHPP vaccinations. Microchipping is an excellent idea and can be the reason a lost pet is reunited with his or her family. In my personal experience, rest break areas can harbor fleas, so I always make sure my dog is current on his flea medicine and I try to stop in neighborhoods vs. traditional rest stops along the highway. Need more advice on keeping your dog safe in the car or while traveling in general? Contact us!